The Roor Bong is a quality product! You would not expect to pay Jaguar prices for a Nissan Micra but you will be getting a Micra and not a Jag! The same can be said for a Roor Bong, you will certainly pay more for one of these classic pieces than you would for an acrylic bong, but you will be getting the ultimate in water pipes. Roor bongs have been made for over thirty years now by German glass blower Martin Birzle, and manufactured using Schott Duran Pyrex Tubing borosilicate glass. All the Roor Bongs that we feature are genuine, so you can be sure of the authenticity. 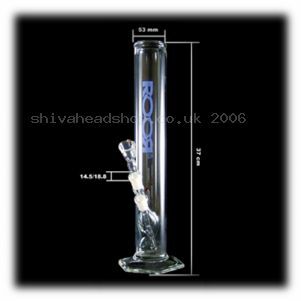 Here at Shiva we stock a range of ROOR products, from bongs to spare parts and pipes, just one of these is the Blue series which have four volume options; 100, 250, 500 and 1000ml. This series has a cylinder, the perfect down tube diffuser, and a separate bowl that lifts off. When you decide upon a Roor you will be able to see the craftsmanship, thick-walled pipes with clean lines, very minimalist finish giving the blue series along with all other Roor bongs their originality. Each Roor bong is made to order and because of this delivery times can vary, but we promise it will be well worth waiting for. Amongst the very special features of a genuine Roor is the high quality silicate glass, a strong saucer shaped base which ensure that they will not tip over and safe to use nad store away afterwards. Roor water pipes also feature glass gauzes which mean that you do not need to keep changing filters. If you’re looking for simple functionality, quality craftsmanship, a great smoke then you have just found it. For more than 20 years Roor have been making some of the most renowned bongs on the planet from their manufacturing plant in Germany. The Roor Bong 500 is hand-blown to perfection, as you would expect from Roor Bongs and is the second largest water pipe made by the company. Standing an impressive 37cm tall, the Roor Bong 500 is stylishly designed and provides a smooth smoke every time. Made from the highest quality silicate glass and hand blown to order, Roor bongs are some of the most thought after bongs in the world and are specially designed to withstand repeated high temperatures that standard bongs couldn’t. It’s 3mm thick walls and hexagonal base mean that the bong is both strong and stable, creating a great base for smoking your favourite herbs. The Roor Bong 500 is available for £84.99 and is the only bong you’ll ever need! Please note: as these bongs are hand blown to order delivery times may vary. ROOR manufactures some of the best bongs and pipes in the world and the ROOR Bong 100 is no exception. At just 24cms tall, the ROOR Bong 100 is the smallest bong in the collection, but pack the same punch as the rest of them. Manufactured from the highest quality silicate glass and hand blown be specially trained personnel, ROOR Bongs are strong and durable. These thick walled pipes can withstand years of use and can also withstand higher temperatures, which makes them highly thought after. The large base also makes this bong sturdy, just what you need when you’re smoking your favourite herbal mixtures. 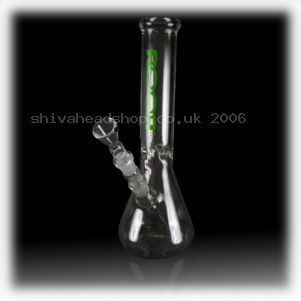 The ROOR Bong 100 is available now for £53.99, but if you’re after something a bit bigger then why not check out the full range of ROOR bongs at Shiva Head Shop. ROOR had been manufacturing high quality glass smoking accessories for many years and are renowned for being the best in the business. They carry on that trend by bringing us the super popular ROOR Steam Roller Pipes, which are hand blown to perfection. The simple yet practical design makes this pipe one of the prettiest and it’s thick glass walls makes it strong and durable as with all ROOR products. These pipes are hand blown using the highest quality silicate glass and are perfect for everyday use. The mini pipe, featured here is a great little pipe for a quick hit and is compact enough to fit into a pocket or small handbag. The mini ROOR Steam Roller Pipe is available now for £9.99 each and the Steam Roller is also available in small, medium, and large if you want a bigger hit. ROOR Bong 100 – Hand blown to perfection! The ROOR Bong 100 is the bay of the ROOR Bong range, but still comes in at an impressive 24cms high. Like all ROOR products, this bong is hand blown using the finest silicate glass making it extremely strong and durable. ROOR Bongs feature a saucer shaped base also made from the same silicate glass, giving it a sturdy and weighty feel and perfect for storing away when it’s not being used. The ROOR Bong 100 also features a glass gauze, which replaces the traditional metal one and can withstand regular heating to higher temperatures. The minimalist but stylish design has become a trademark for ROOR and looks great on any table or shelf. The ROOR Bong 100 is available now for just £53.99 and is guaranteed to give many years of service. 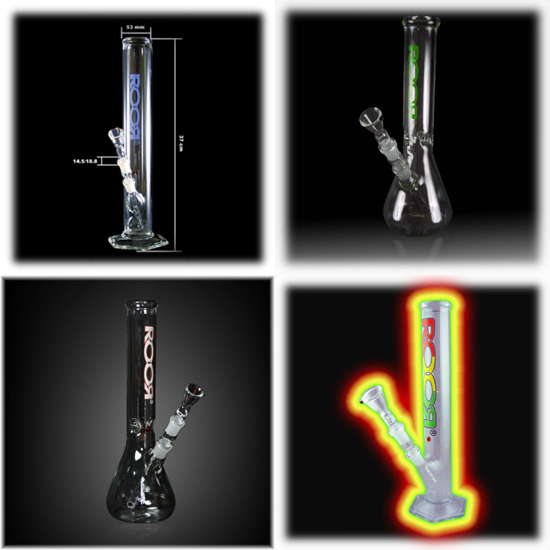 ROOR Bongs have been manufacturing hand blown bongs for many years and are regarded as one of the best bong makers in the business and the Little Sista Ice Master bong is no exception. This piece of glass art is impressive to look at and is great for smoking your herbal blends. The Little Sista Ice Master 7mm bong as the name suggests is made from 7mm thick glass, which is strong and durable and extremely high quality. 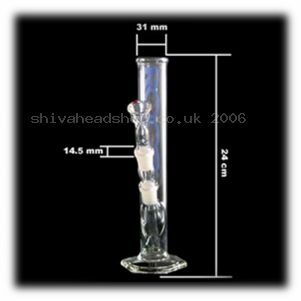 The conical shape means that this bong can hold more water and ice providing a smoother and cleaner smoke compared to standard bongs. The 18.8 bistable joint and glass gauze make the Little Sista Ice Master 7mm bong durable to use and easy to clean and makes it one of the most thought after bongs on the market.